Successfully Added USB Speaker for Laptops (5W High Fidelity Edition) to your Shopping Cart. USB Speaker for Laptops - the latest solution in plug-and-play portable computer speakers comes in a sleek and aesthetic design that is both easy to use and easy to carry around. In terms of quality, the internal left and right speakers along with a bass enhanced center speaker makes listening to multimedia on your computer that much more enjoyable. 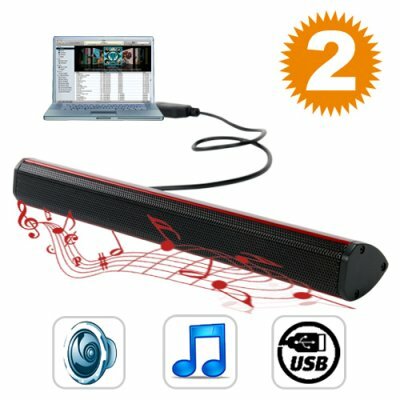 Whether you are watching movies, listening to music or gaming, if you need better sound from your laptop, then this USB speakers are your best option. Both portable and stylish, the unique design will look great wherever you put it while hardly taking up any space. It is also powered completely by USB, so there is no need for heavy and bulky adapters, plugs or batteries and is ideal for anyone who travels with their laptop by their side. This speaker come complete and ready to go and do not require any driver or software installation. All you have to do is plug in the USB to receive 5W speaker output and full bass from the unique bass enhancement technology to make your audio sound better than ever. Along with support for both Mac and all Windows operating systems, amplifying the tiny sound of your laptop speakers has never been easier. While other portable speaker solutions this good cost five times as much, these stylish USB speakers are brought to you at a factory-direct Chinavasion price which means great savings for the individual buyer and great profit for the retailer buying in bulk. These amazing speakers are in stock and ready to ship directly to you or your customers from your best source for high quality, low price gadgets, Chinavasion. Sound is even better than our famous hamburger speakers! Compact, lightweight portable sound system can be easily along with your laptop to carry. With the USB cable to connect your computer. How loud are these speakers? 5W total, but the maximum volume is much louder than you would actually use them for and definitely loud enough to wake the neighbors. Do these speakers always have to be connected to a USB port? Yes, you have to plug this device into a USB port to use it. greatest invested I ever made better than the speakers on y laptop, but why is this not avaliable anymore? I plugged it in and it worked straight away. No hassles, no fuss. Great stuff.